Thank you for joining me as we count down to the next MFT release. We are five days away from the big day! All the new Stamps, Die-namics, and Stencils will be available on Tuesday, September 16th at 10:00pm EST. Be sure to check out the MFT Blog to see all the new items being revealed today. Don't forget to leave a comment on the MFT Blog Countdown posts, YOU could win one of the seven $75.00 gift vouchers. 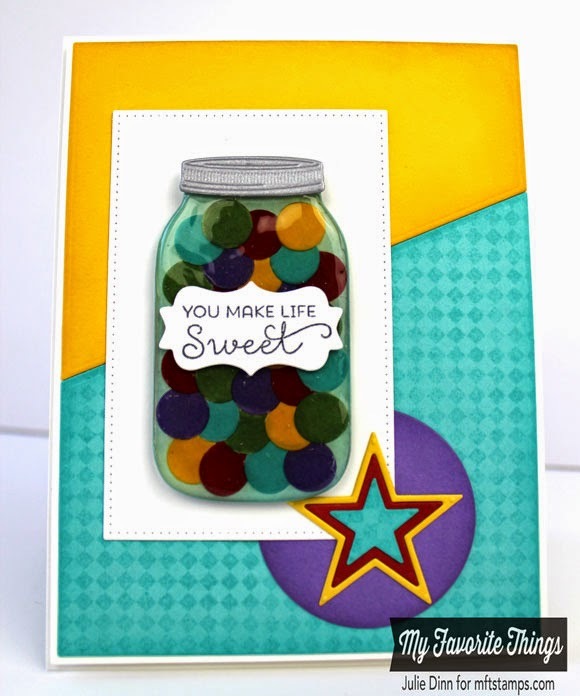 I have two fun cards to share with you today that feature the new Mason Jar Die-namics and the Mason Jar Labels stamp set. I had a ton of fun creating these cards and I used a ton of Crystal Effects and embossing powder in the process! 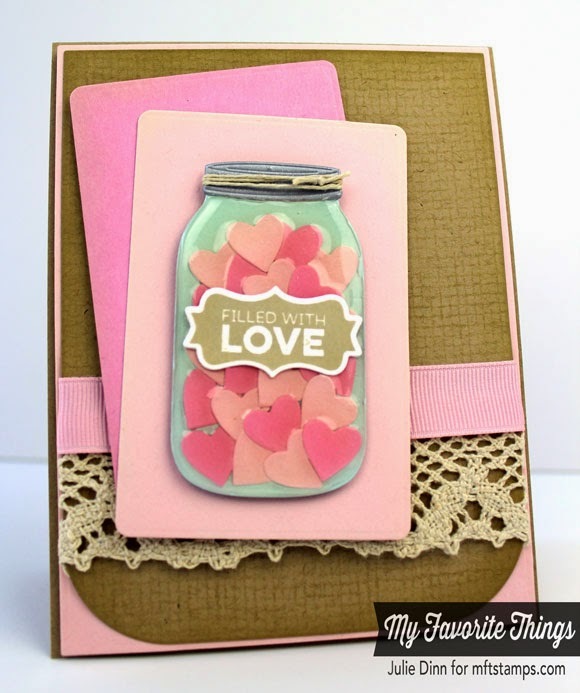 To create this love filled mason jar, I die-cut the jar in Sno Cone card stock and the little hearts in Pink Lemonade and Bubblegum card stock. I adhered the hearts onto the Sno Cone card stock and then I added a layer of Crystal Effects. I let the jar dry over night and then I added another layer the next day. Once this layer was dry, I added a silver top and a piece of Hemp Cord. 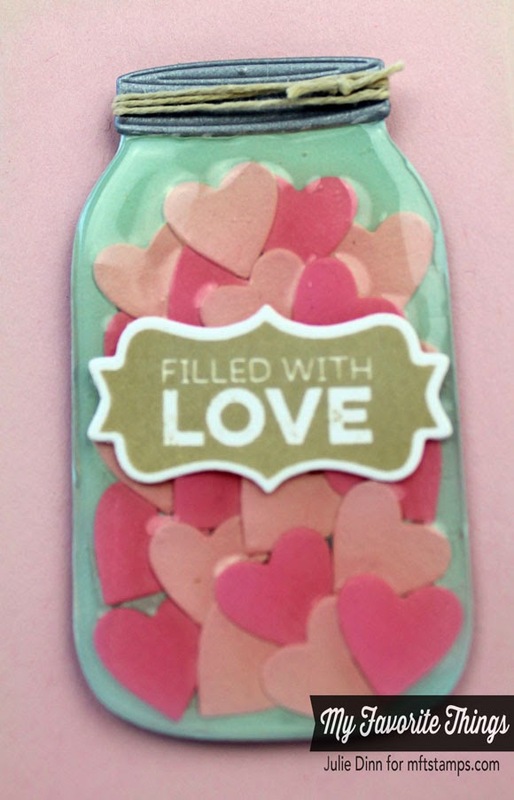 The sentiment is from the Mason Jar Labels stamp set. Don't you love the shape of the label? I used the Blueprints 10 Die-namics to create the large panels on this card. I just love the curved edges! I stamped the background with the fabulous Burlap Background stamp and Kraft ink. I left lots of room for a sweet love note in this one. My second card is full of bright and cheery gum balls! Once again, I die-cut the Mason Jar in Sno Cone card stock and I adhered all the gum balls to the jar. Instead of using Crystal Effects on this jar, I used layers and layers of Ultra Thick Embossing Powder. 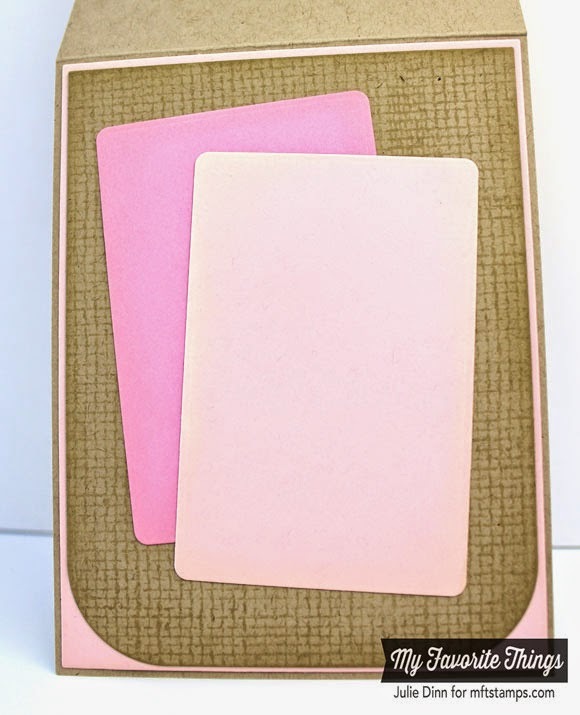 I really like the look of the Ultra Thick Embossing Powder, but you do need to be careful not to bend the card stock or you will get a crack in your "glass". I used the Blueprints 18 Die-namics to create the base of the card. I thought the diagonal panels went well with the sentiment that I stamped on the inside of the card. I also used a new background, the Fine Check Background. It's another great one! Thank you so much for joining me again today. Your sweet comments the last two days are so appreciated! Thank you! Be sure to check out the MFT Blog to see what the Design Team has created to share with you. Wow I love how the crystal effects made the jar look like glass. Great cards! The crystal effects add so much to the cards. Love the pink with the kraft. Both cards are awesome...love the crystal effects and the embossing....this is a great set! Julie!! Crystal Effects? Under what rock have I been crafting??!! Holy glass-like finish... and that jar lid is so lifelike! 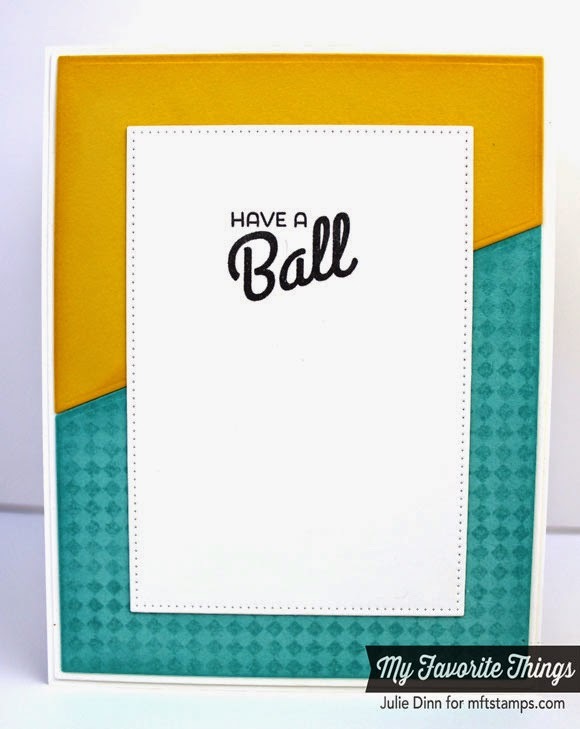 Cute cards, your card gave me the idea of gumballs! So many ways to use this jar. Nice work. How Sweet is that so cute.. Love them and makes you want to eat them. On the first card, I like how you added some cord to the Mason Jar lid. Both cards you've done a great job on. OMG, these cards are amazing! The Crystal Effects really makes those mason jars look real. Well done! Love both cards, especially the second one!! Love your ideas and you made the jars look so real with your effects. Thanks for the inspiration! Oh wow!!!! Your jars are wonderfully shiny!!!! I am in awe of both. It takes amazing patience to get Crystal Effects to look that good!!! Wow! Fantastic cards. I love the glossy, lifelike effects you have achieved with the crystal effects and the heat embossing. Fantastic technique. I'm really going to have to try these techniques they look amazing. Shut up!!! These are brilliant, I love the look of the jars! OMG! These are amaze-balls and they definitely stole my heart! Awesome! Great way to get some glassy glass! 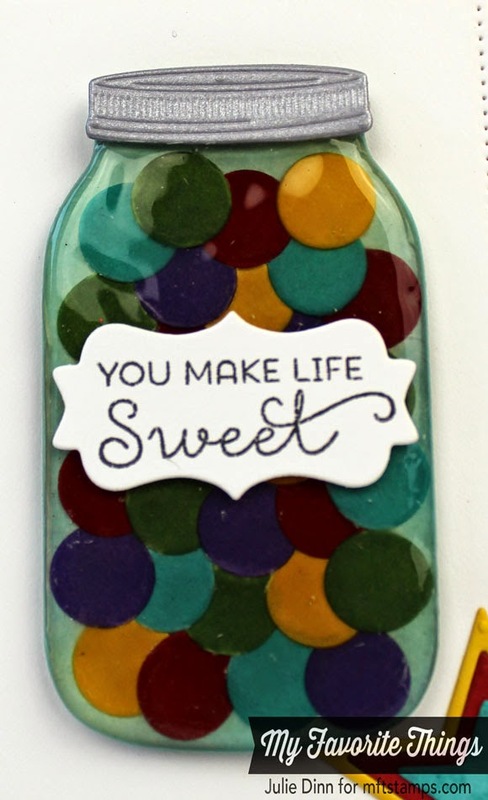 I love these sentiments and the wonderful colors you chose! TFS!